In continuing our discussion on Weibull Analysis, let’s assume we assembled some SMT and through-hole PCBs with lead-free solder paste. On this board are also some bottom-side terminated (BTC) components (often called QFNs), that are also assembled with solder preforms. A stress test is performed to test the BTCs. 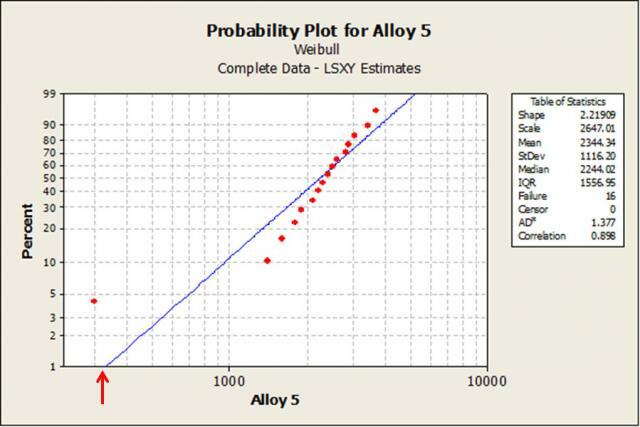 In such a test, the first fail in Weibull analysis is the most important data point. No matter the results of remainder of the data, these later fails cannot undo the effect of a very early first fail. To understand this concept, let’s look at the Weibull chart below. In many high reliability applications, there may be a requirement that some small percentage of the components under test have at least some minimum reliability. Figure 1. Weibull Analysis with an Early Fail. As an example, let’s say that 1% of the components cannot have less than 500 cycles of life. By looking at Figure 1, we see that 1% have less than 150 cycles of life (see arrow.) 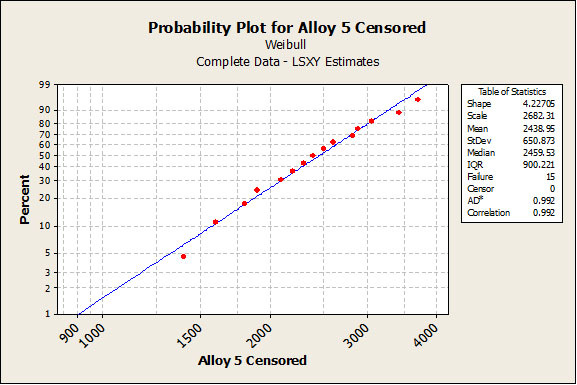 This one early outlier dramatically affects the Weibull Analysis. Figure 2. Weibull Analysis with the Early Fail Removed (Censored). Why might an outlier like this exist? Almost certainly there is something unusual about the early fail. It might be something like an oxidized pad preventing good wetting of the solder. Perhaps something like this failure mode might be discovered in root cause failure analysis. However, I am typically opposed to censoring data, even with supportive failure analysis. I think the test should be done over. It is often too easy to talk yourself into accepting inconclusive failure analysis.